Businesses with 10 or more reviews get 3.5 times the attention and 6.5 times the inquiries. Local behavior and mobile signals can play a role in search results. 91 percent of consumers turn to their mobile devices in these moments for help making decisions. If you’re a real estate professional and have been in the business for more than a few months, you know firsthand the challenges of getting found in local search results. We call this local SEO, and it’s a lot different than your average SEO campaign — but more importantly, it’s something you can control. There’s an art and a science to cracking local search, and this guide is your insider’s view to making it happen. Recently, the National Association of Realtors’ Digital House Hunt study found that 69 percent of homeshoppers who take action online begin with a local search term. Further substantiating a shift to local search, a Google report from this past April found that Google searches containing “near me” have increased 34 times levels recorded in 2011. With a couple big changes occurring in local SEO over the past few months alone, it’s a good time to explore some new opportunities and reinforce old tips that will help you attract local buyers and sellers. To kick things off, let’s take a look at one of biggest changes to local SEO over the past 12 months. In August of 2015, Google surprisingly cut back on the number of results that display in the spotlighted pack on its local search engine results pages (SERPs). The change brought the seven local businesses highlighted down to three. Why the change, you ask? Well, for starters, three results shows up better on mobile — where most local searches are coming from. Adding to this significant change, Google also tweaked the options you have for clicking on these businesses. Local searchers now have the option to click on the Google My Business review page for the business, the business website link and the directions link. Make sure you also have a phone number listed. This number should match the local area code. If you’re not willing to trade in your mobile number, it might be worth going the Google Voice route and getting a number that fits the area code you do business in. Google does allow you to add carousel photos to local search results now. Therefore, it’s important to go with a landscape photo that displays well. The website you are linking to (URL) should be the actual homepage of your business. 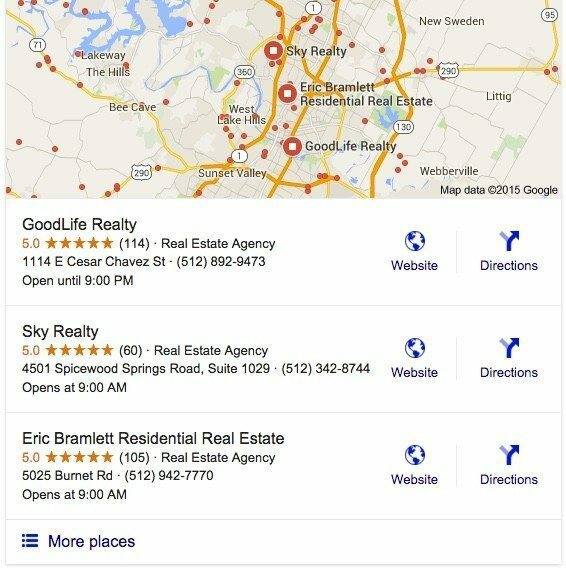 If you’re a brokerage with offices in several cities or neighborhoods, it’s important to have a separate location page for each office that matches the name, address and phone number listed on your Google My Business pages. It’s important to find the most accurate category for your business. Real estate agent and real estate agency are both category options, but real estate brokerage is not an option. With the changes to local search results, having a digital review strategy in place is also crucial. With clickthroughs on the Google My Business page no longer going to a direct Google Plus page, users will also see 10 other competitors on the left side of their screens. Under each of those competitor businesses they can see how many reviews the business has gotten. Given that businesses with 10 or more reviews get 3.5 times the attention and 6.5 times the inquiries, it’s no longer enough to dominate local search. You need to dominate local reviews as well or someone might jump to a competitor with more or better reviews. Need data to back that up? BrightLocal’s 2014 Local Customer Review Survey of over 2,000 consumers found that 88 percent of respondents read or used reviews to determine the quality of a local business. Now that we’ve gotten through how to optimize for Google’s new look with its local pack, it’s time for a refresher on organic SEO to get into the top three locally. First, let’s define SEO. SEO is the series of steps you take when building and maintaining your website that enable it to be found in search engines. With good content, copy and linkage, sites appear higher in search engine rankings. With bad content, copy and linkage, sites appear lower. Your SEO ranking is where you appear in search results. Rankings are often most influenced by the linking a website receives from other sites, as well as on-site signals such as domain authority and keywords. Although there are other signals that affect your ranking, the website that gets more links tends to get a higher ranking. One of the factors that search engines consider when determining your page rank are keywords. Keywords are words that identify your products and services and match them with search engine inquiries from all the potential customers out there scouring the web. Keyword research might be the most overlooked aspect of SEO. Although most real estate marketers will spend hours on their social media and content marketing strategies, few spend the time needed to learn how to actually do effective keyword research. Easy-to-use tools such as Google Trends can help you get an idea of what terms potential leads are using. 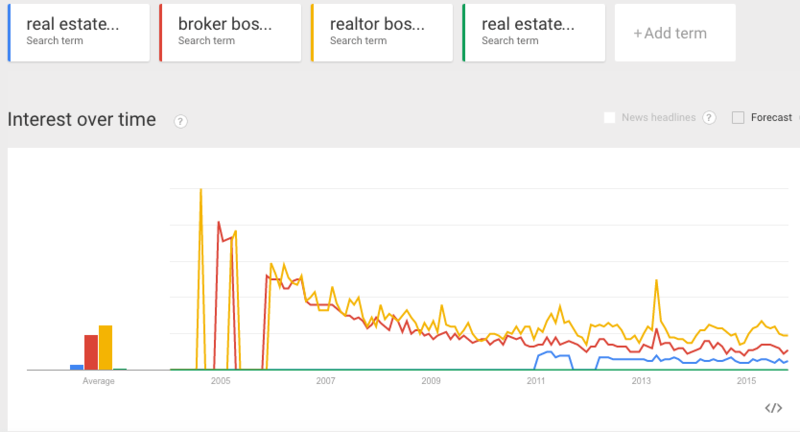 In this Google Trends example, I searched for “real estate agent Boston,” “Boston broker,” “Realtor Boston,” and “real estate agency Boston.” You can see that though the terms follow roughly the same search trends over the past 10 years, “Realtor Boston,” is still the top search term over time when compared against the other queries. If you’re operating in Boston as a brokerage, you’d want to build that into the keywords you’re targeting. In addition, the right keywords will ensure that your content marketing efforts aren’t wasted attracting the wrong customer, or worse, no customer at all. Remember, including your location in your keywords is a great way to make sure you reach customers specifically interested in the market you serve. We’ve got a super-in-depth guide to keyword research that you should definitely save for later reading. Because SEO is all about getting people to visit your site, having outbound links might seem counterintuitive to your efforts. But in reality, if you don’t have outbound links your site essentially becomes a dead end. By linking to quality resources that provide further help and value for those that visit your site you will improve your reputation and search engine ranking. SEO expert and Coldwell Banker Agent Tony Gilbert said internal links are links that point to other related pages on the same domain, rather than third-party sites. Whenever you generate a piece of content, such as a blog post, you should link to three to five other pages or blog posts that are relevant to the topic. This will allow visitors to find more information on the topic, and it also allows search engines to locate and index older posts. Inbound links, or backlinks, are one of the most important parts of SEO. You need others to link to your website or else it will be nearly impossible for potential customers to find you. There’s no shortage of strategies to get inbound links, but that doesn’t make it any easier. Later on in the post, we’ll talk about one of the most effective ways to get people to link to your site: content creation. Now, how does local SEO differ? Although there’s a lot of overlap in the elements that apply to both local and regular old SEO (indexing, on-page factors, social, listing optimization, backlinks and great content), there are differences. Local behavior and mobile signals can play a role in search results. A high rate of mobile click-to-calls and check-ins can positively affect the way your business turns up in local search results. In addition, when looking specifically at local search in the real estate space, we do need to take a gander of Google. 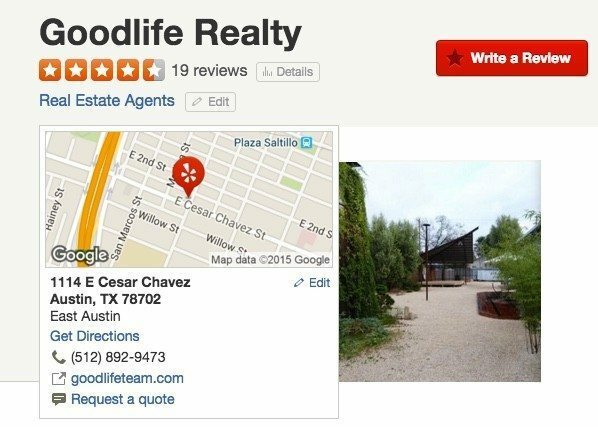 Yelp, realtor.com, Trulia and Zillow can all play a role in local real estate search. Then there are citations. A citation is simple: It’s any place online that uses your company NAP (name, address and phone number) all on the same page. It’s imperative that this citation information is in the same format as your local listing. Citations are a key component of the ranking algorithms in Google and Bing. The way citations help in improving your SEO is actually really simple: the more often that a citation is the same for a business, the higher it appears in search results. Lastly, there are reviews that extend outside of Google. The quality and quantity of reviews that customers leave for your business on Yelp (especially of iOS search results) are some of the most important search ranking factors outside the Google ecosystem for local discovery. As we noted last year, creating great content with a regular cadence is still king. The real estate industry has a reputation of producing some fairly lack luster content, which is why there aren’t a lot of show-stopping content marketing examples in our industry. But, it doesn’t have to be that way. One great content creator in the real estate field Bill Gassett of MaxRealEstateExposure who does a fantastic job creating content. He might be the first to tell you that his site could be prettier, but look at his content: people read it and share it. He’s taken the time to build a tribe, and he rewards them with well-thought-out and timely content. Many could learn from Bill’s example. He even ties his content to to timely events that have mass appeal such as Halloween. Another content rock star is Melanie Piche and Brendan Powell of the Brel Team. Their buyer tools and resource page is robust, well-thought-out and segmented in a way that allows each of their buyer personas to find the answers they are looking for. Piche is a content creating machine who understands her market and has developed a marketing strategy to connect and nurture her target audience. And if you haven’t yet met Shay Hata, she is amazing, in just a over a year she has built a massive library of content that she uses to get found online, empower the sales process, add value to her email marketing and showcase her subject matter expertise to everyone that comes in contact with her. She uses a simple formula called “They ask, you answer.” The formula was made popular by the marketer Marcus Sheridan, and it goes something like this; if a prospect or customer asks a question more than once, create a piece of content that answers that question. Content is your friend, and when done right, it can become a rainmaker for your business. Or they could be walking through a neighborhood that they like and search “real estate agents nearby.” This is a change in how consumers are making purchase decisions. Google has found that 91 percent of consumers turn to their mobile devices in these moments for help making decisions. For instance, there could be a micro moment of querying “help selling my house in Boulder.” A tailored post or Google ad that says “Stuck selling your house in Boulder? We’ll help,” could create some serious clickthroughs. Even better — time it (around public reports, etc.) for when the prospective market turns in the buyers favor. Buyers and sellers use of home-related searches on mobile and tablets hit 60 percent last year, and we’ll see that mark passed again this year. If your website isn’t responsive on a mobile device, you are likely turning customers away. It’s no surprise then that Google also changed its search algorithm earlier this year to reward businesses with mobile-friendly sites. To make sure you website is optimized for mobile you should try Google’s Mobile-Friendly Test and Webmaster tools to self-evaluate. Facebook and Twitter have quickly become the standards for places businesses need to be in the world of social media. One of the most important things you need to make sure you have on both of these platforms is clear and consistent contact information that matches exactly with all of your presences online. It’s also important that you aren’t just squatting here. Facebook and Twitter provide a powerful way for you to engage with your audience through the content you post. Although Google still doesn’t index the vast majority of tweets, Twitter is a very effective way to get traffic to your website that can have residual benefits on your SEO traffic. The explosion of Pinterest as one of the most popular social networks around is intriguing for the real estate community. What’s even more intriguing is the fact that Pinterest was directly responsible for more than three times the Web traffic that Google Plus, YouTube, Twitter, StumbleUpon, LinkedIn and Reddit were combined. Pinterest boards rank extremely high in Google searches. This means that people can search Google, be directed to Pinterest, and find your website from there. Pins also have a long life span. Pinterest boards rank extremely high in Google searches. Get creative with Pinterest. If you’re operating in the Austin, Texas, area, you could create categories of boards that look at five of the best suburbs around Austin to buy a house in. 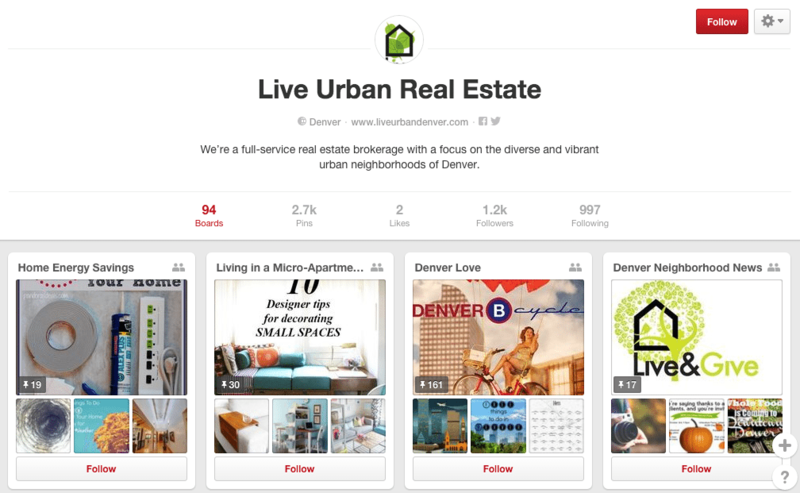 If you want a great example, take a look at the boards Stacie Staub put together at Live Urban Real Estate — they’re spot-on, each board is engaging and related to their business. 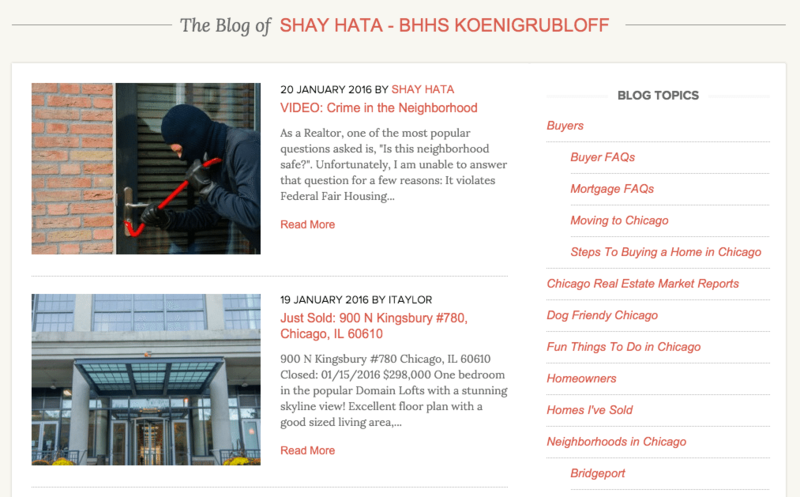 According to Staub, “Pinterest is the third biggest source of traffic to our website after Google and Facebook.” It also turns out that their neighborhood boards drive the most traffic to their blog. 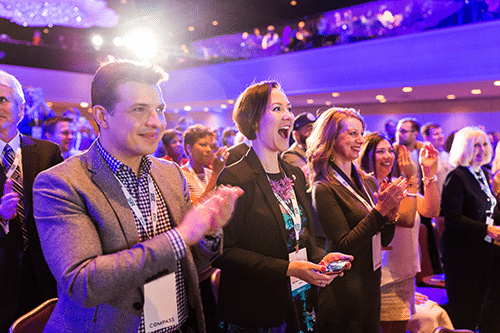 They’ve also done some great co-marketing by partnering with a local publication called Denver Vibe, which has dramatically increased their Pinterest interactions to lead conversions. This is the power of the pin. Agents and brokers need to consider what they’re doing with video marketing and YouTube this year and beyond. Agents that are succeeding with YouTube today are producing quality videos from how-to videos, local market updates, listings or interviews with local business and restaurant owners that give prospective buyers a real feel for a neighborhood. They are also optimizing them for local search. Just like you need a SEO-friendly and enticing title with a blog post, you need to create titles for your real estate videos on YouTube and other sites that tie-in industry keywords and make viewers want to watch them. When we think about SEO, it’s easy to become entirely focused on ourselves. What do I need to do to bring people to my site? Although this is the correct mentality to have, it’s important to remember, there’s no “I” in SEO. To have a truly optimized SEO strategy, it’s important to look beyond your own properties. One way to do this way to do this? Blog commenting. Yes, blog commenting is an old SEO tactic. People used to spend money to have spam comments written for them all over the Internet. This doesn’t work today because Google and comment systems have gotten a lot better. However, commenting does help build the traffic to your blog. You can get some great referral traffic simply by commenting on high-profile blogs in the real estate niche. Heck, get started by commenting below. Google continues to illustrate that with various updates to their algorithms and quality controls. As you move forward with your overall marketing program, it’s important that you continue to look at local as a subset of a broader SEO strategy. It’s like a puzzle, and each piece connects with each other. If all the pieces are working together to boost your agency or brokerage onto the front of general search results, it’s likely you’re going to be at the top of local results as well — as long as you’re covering your local bases. How do you think local real estate SEO will evolve in the years ahead? I’d love to hear your comments below. Seth Price is VP of Marketing at Placester, a passionate content creator and host of the Craft of Marketing Podcast. You can connect with him on Twitter @sethstuff or LinkedIn.